These lions are not albinos (which many people think), however they are unique to the Timbavati region of South Africa. These lions carry the gene known as a colour inhibitor and are from the Kruger subspecies of lion (Panterha leo krugeri). These lions are now classified as a vulnerable species. 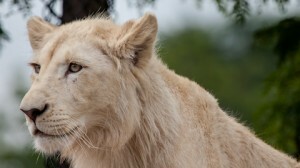 The white lions are almost one year old now and I noticed that the male is starting to develop a beard and also a mane. It will be great as I go to the Toronto Zoo over the next few months to see these white lions develop and grow towards full sized adult lions. If you get a chance to go to the Toronto Zoo, make sure to check out the new white lions that are currently out on display and be sure to see the zoo keeper’s daily talk at 1:30 p.m. Sometimes when the daily talk occurs, the lion keeper will throw them a “snack”—however the last time I was there he explained to me that the male has started to be more aggressive and so he didn’t give them a snack on that particular day. Norm, That is a good story, you did that well.